Last week’s post was all about iterating on an existing recipe. This week, we decided to talk about one of the other things we like to experiment with here at Booze Nerds HQ, trying different types of the same ingredient. We thought we’d experiment with different orange liqueurs to see what a difference that one ingredient makes in a drink. To keep the flavors clear, we decided to use a simple Kamikaze for the cocktail (often unfairly maligned, delicious when made properly). Read on to find out how much your choice of liqueur may affect the drink. We currently have seven different orange liqueurs in the liquor cabinet: Giffard Premium Triple Sec, Cointreau, Pierre Ferrand Dry Curacao, Clement Creole Shrubb, Patron Citronge, Combier L’Original Orange, and Grand Marnier. For our Kamikaze recipe, we used equal parts of vodka, orange liqueur and lime juice. We used the Peabody Jones vodka, one of our local favorites, for all seven drinks. Nose: Sweet malty grain, faint orange and lime. Orange is a touch stronger than the lime. Palate: Vodka shows clearly on the front with sweet grain and malt. Faintly floral orange on the mid-palate with orange candy notes. Very strong fresh orange & lime on a fairly tart finish. Nose: Sweet orange predominates, with a little bit of lime and a little bit of sweet grain. Palate: Fresh, slightly sour orange throughout, strongest on the mid-palate. Malt and tart lime on the finish. Well-balanced sweet/sour, less sweet than the triple sec and the curacao. Slight chalkiness in the mouth feel. More fresh orange flavor when tasted side by side with the others. Palate: Marmalade and brandy to start. Honey graham cracker, sweet orange and lime on the mid-palate. Tart lime finish. Nose: Sweet orange, little bit of rum, slightly astringent fresh orange smell. Palate: Perfume-y, almost soapy orange to start, followed by artificial orange flavor somewhat like Tang. Light lime on the finish. Lime tartness is present but not really lime flavor so much. Very unexpected as we quite like this liqueur but clearly it doesn’t play well with certain combinations. Nose: Agave and lime, muted orange. Palate: It’s a margarita. 😉 Tiny bit of vodka maltiness. Would work quite well for people who want a little bit lighter margarita. Lime zest & faint orange to start. Orange & agave on the mid-palate. More agave on the finish. Bitter vegetal after taste. Not what one would consider a kamikaze, but tasty none the less. Even more margarita like as it warms up when compared to the others. Nose: More muted orange and lime, more malty notes. Orange is more bitter than sweet. Palate: Sharp, bitter orange to start, very pith-y. Woody, slightly savory notes on the mid-palate along with citrus zest. Very dry overall. Very different from the others – sharper, more bitter and complex. Nose: Very rich nose. Sweet brandy and orange. Muted lime, not much malt. Palate: Cognac to start. Little bit of orange from the intro to the mid-palate. Orange is fainter overall compared to the others, while lime is a little more forward. Interesting fruity finish. 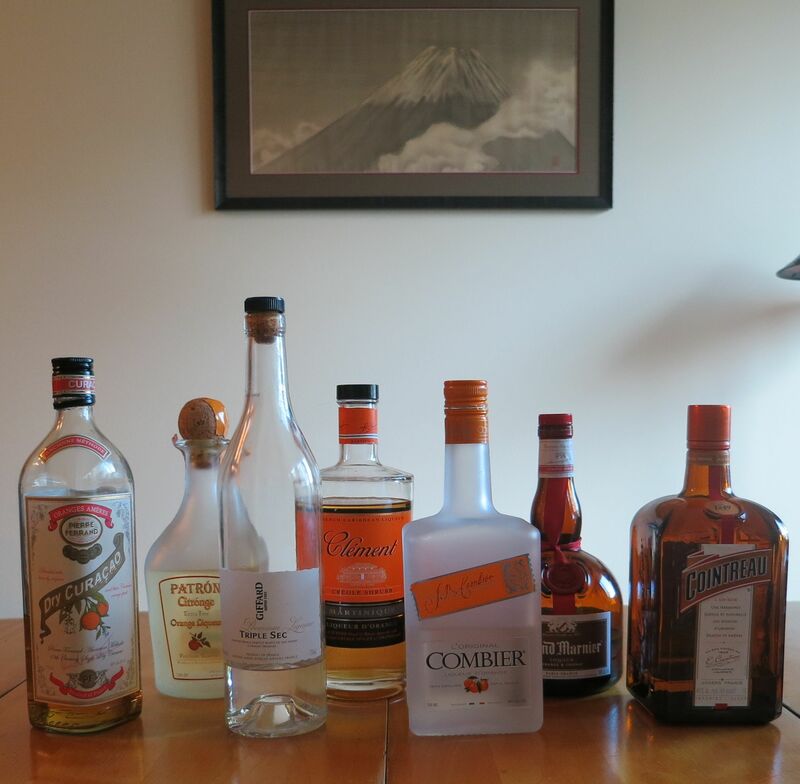 Christa’s favorites: Cointreau, Curacao, Combier, Triple Sec, Grand Marnier, Patron, Clement. Shaun’s favorites: Curacao, Combier, Cointreau, Triple Sec, Grand Marnier, Patron, Clement. The ones we both chose for the top three (though in different orders) all have clear orange flavor, balance between the ingredients, and balance between sweet and sour. The Triple Sec was fine but didn’t have anything that made it stand out to give it interest. Grand Marnier and Patron were both tasty, but the strong contribution from their base spirits made them taste more like a Sidecar and a Margarita, respectively, so not great choices for a Kamikaze. The Clement (despite being delicious, really!) just doesn’t work well in a Kamikaze, period. This entry was posted in curacao, lime juice, orange liqueur, triple sec, vodka and tagged kamikaze cocktail recipe. Bookmark the permalink.